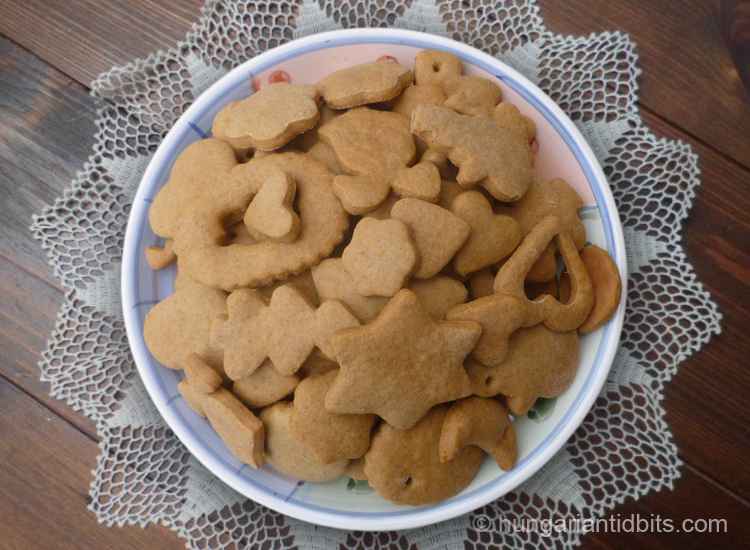 These aromatic honey-ginger cookies are easy to make, ideal for tree decorations, make nice presents and good to eat on their own straight after baking. The dough could be made days ahead and stored in the fridge until use. The dough has a minimum 1 hour resting time, best to make it hours ahead of intended baking or the night before. Warm the butter and honey together slowly. When the butter melted, set aside and cool until just warm, could fill the sink with a few inches of cold water and stand the pan with the hot butter and honey to speed things up. Whisk the eggs with the sugar, spices, bicarbonate of soda, add the lemon and orange zests with the lemon juice. Work in the now cooled honey and butter mixture. Dust a sheet of plastic wrap with flour, place the dough in the middle, wrap it tightly and rest in the fridge for minimum of one hour, but could be 1-2 days. After resting the dough, preheat oven to 180°C [350°F]. 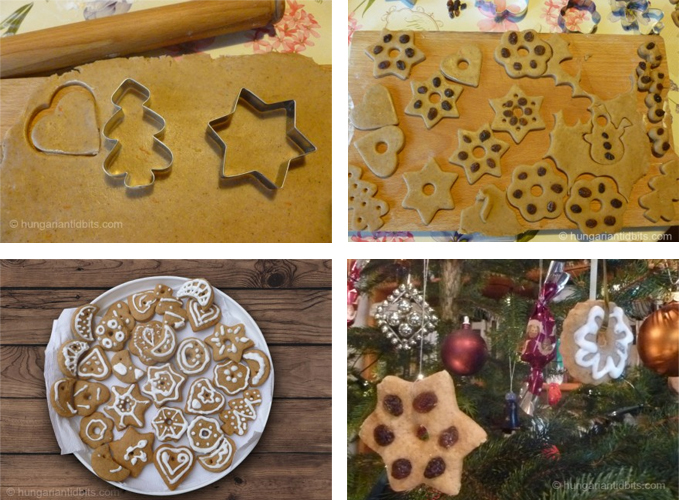 Cut out various shapes with cookie cutters and lay them on a baking sheet lined with baking parchment. Bake at 180°C [350°F] for 10-15 minutes, keep an eye on it as it can burn easily – speaking from, ahem, experience. Let it cool completely before icing. You could use raisins, sunflower or pumpkin seeds, these can be added after cutting the shapes out and before baking. If decorating with icing, wait until the cookies are baked and completely cool. – Beat the egg white with an electric mixer until firm peaks form. (2-3 minutes). – Add half of the sugar mixture to the beaten egg white, start slowly (otherwise it will go all over) increase the speed gradually, work for about 3 minutes, add the second half of sugar mixture in a similar manner and beat for 5 minutes. Add the lemon juice at the end and combine through. The icing should be a thick cream consistency. Use with a piping bag to decorate the cookies. Plastic sandwich bags are a popular substitute for piping bags, cut a tiny hole at the corner as it will stretch further with the icing.